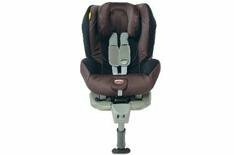 6th Britax Explorer Isofix Ultra 229.99 | What Car? The Isofix version of the Ultra still has the adjustable headrest which protects the child's head. The four reclining positions are retained, as are the excellent cushioning and padding. As well as Isofix mounting, the seat can still be secured with a seatbelt. It's easy to adjust the headrest and harness height to suit your child as they grow, and hooks keep belts out of the way while you're settling your child in. Connecting the seat to Isofix mountings is fairly simple, and only made a little awkward by the cumbersome nature of child seats in general. Indicators let you know you've done the job right but, as always, don't forget to check that the seat is compatible with your make and model of car. Ouch like all the Isofix seats here, this isn't a cheap option. If you need to switch seats from car to car a lot, the ease of fitting Isofix may make the extra cost worthwhile. However, there's the extra weight to consider as well. Discounts are available to take a little of the sting out of the asking price, but it's still costly. We've no complaints, with strong, sturdy materials used throughout. Safe strap' indicators that flip down to let you know when you've properly tightened the belts around your child once again a feature. It is interesting how tight you have to pull the belts, but a little disconcerting how the indicators flip up again after a little while, despite the belts not obviously loosening.